I knew that once I cast on the first stitches that I would just keep going. So I ‘adulted’ first and cleaned the kitchen, sorted laundry and put the first load in to start. 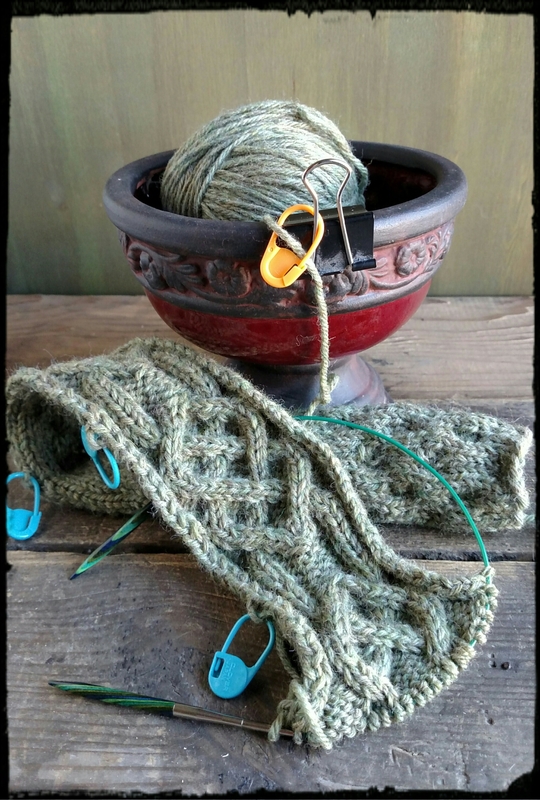 This pattern starts first with the waistband and then the stitches are picked up along both long edges to form the bottom and top body of the cardigan. It calls for DPNS but a circular needle is my preference and the results are the same. Did you notice my yarn bowl? I got the idea from Patchouli People‘s Frugal Friday post from a couple of weeks ago. Only instead of a binder clip and mason jar I used a decorative bowl I already had and took the binder clip a step further by adding a locking stitch marker so that when I wanted to take my project on the go I could remove the yarn. The bowl is nice and heavy and serves the purpose well. I actually had know idea how much easier it would make things until I started using it. I may still end up purchasing a yarn bowl this summer. There is a vendor at our local Farmer’s Market that hand crafts ceramic ones and I’ve had my eye on them for a while now. But until I give in to the urge to purchase one this one works beautifully. Very nice. I like cables!